Qal'at al-Bahrain is the archaeological site of a port which was once the capital of the Dilmun civilization, and served more recently as a Portuguese fort. It is a typical tell - an artificial mound created by many successive layers of human occupation. The hill shows almost continuous remains from ca. 2300 BC to the 16th century BC. They span the Dilmun, Tylos, later Islamic societies and the Portuguese period. This makes it a rare archeological and historical reference site in Eastern Arabia and the Gulf region. The site gets its name from Qal`at al-Burtughal (Portuguese fort). In the early 1500s, the Portuguese saw Bahrain as a key point to protect their trade routes between India, Africa and Europe. They invaded the island and set up military base at the Bahrain Fort. They strengthened the already existing fortress and erected new stone towers. The site was only rediscovered in 1954. Restoration was started in 1987. Bahrain Fort is located on the outskirts of Manama, with good views over the sea and to the highrise buildings of the Bahraini capital. To my surprise there were dozens of other European tourists around. Most of them Germans, busloads full of them, maybe they were from a cruise ship. They however did only a quick tour of the site, so I had most of it to myself anyway. I started with a circular walk outside of the walls. The edges of the terrain are covered with some pretty palm groves, which have been in use since ancient times. The fort itself looks almost over-restored. Compare my photos for example with the one taken by Paul Tanner in 2005 (see his review below). It seems that it has been white-washed during the final phase of restoration. The fortifications look like they always do (I do like the straight lines of the walls and the shape of the turrets). The interior holds a remarkably large open courtyard. The surrounding structures are in ruins and one can only guess what they were used for. There's a small museum on site, that displays a lot if items (pottery, stamp-seals) that I had already seen earlier in the day in the more extensive National Museum of Bahrain. It was only there that I found out that there is an entrance fee to the Fort - after arriving I had just walked up and around it without being bothered by anyone (the ticket lady hides herself in the museum). The complex has a pretty good museum café too, where I enjoyed a salad on the terrace while overlooking the fortress and the harbour. To avoid the unbearable afternoon heat of Middle East, I decided to visit the first Bahraini World Heritage Site, Qal’at al-Bahrain fort, in the late afternoon, a nice recommendation by locals but unfortunately not a good way to appreciate the site’s experience. I arrived the fort around 4 PM, forget that in November the sunset will be around 5 PM. The entrance is free, so I walked directly to the fort. The complex is indeed a very large archaeological site that has many layers of history from Dilmun, Greek, Arab and Portuguese. The first site I saw was the ruin of small water channel that once was the most important harbor of Dilmun Civilization. Then I saw the ruins of Dilmun city which easily recognizable by large stones for construction. The Greek city was just next to the Dilmun counterpart and was built by much smaller stones and mortar. It was already twilight, I felt sad that I could not see any details of the Arab city. Since it was too dark to see historical ruins, I went to see the most impressive part of this complex, the Portuguese fort which was brilliantly illuminated by floodlights. The fort was once the Arabic fort and then Portuguese built European styled fort on top of it, so the fort is the melting pot of two styled military architecture. But to be honest there is nothing much interesting on the design of the fort. 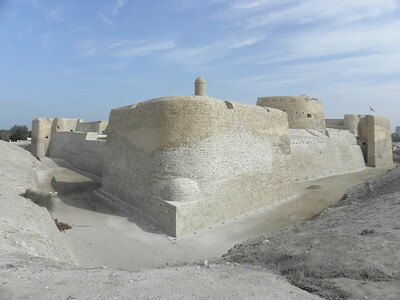 The most unique elements I found on this fort are there were many rooms dedicated to make date honey which was once an expensive export and there was a large spring that could supply the whole complex, something hardly to be believed that Bahrain in ancient time was the land of springs and honey. The fort is maybe the best place in Bahrain, for tourist facilities with air conditioned nice café, interpretive center, proper car park and good toilets. The complex also the most famous tourist attraction of Bahrain and popular among locals and tourists. Here I found more tourists than any places in this tiny kingdom. While there is no question for its outstanding universal value; the whole experience from the site is not quite match for its reputation. Maybe in my opinion, the fort is too much European than my original thought with only few elements of Arabic, so it was lacked of exotic feel of Middle East, like I found in Nizwa or Bahla Forts in Oman. I visited the fort with my parents in the mid 60's. there was an excavation of some kind going on even collected a sliver of wood from some of the beams that were being removed.kept it all these years. we were there in 1965 or 66. 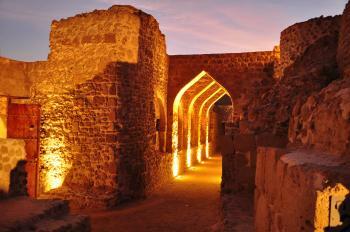 Today we stop at the first UNESCO Site Bahrain has: Qal'at al-Bahrain (Ancient Harbour and Capital of Dilmun). It's also called the Portugese fort or Bahrain Fort (located in Karbabad on the junction of Karbabad Ave. & Qalat Al Bahrain Ave). From around 2400-2300 B.C. this place has been inhabited by humans and served first as the Dilmun capital. The Portugese fort is the last remains of the 16th century. I remember what we called the Portuguese fort from my childhood as my father was stationed in Bahrein in the late 1960s and the archeologist Geffrey Bibby and his Danish team were exploring sites in both Bahrein and on the mainland.As teenagers we would go out either to the fort or to the burial mounds and do what was called 'pottery picking' returning with jars of broken bangle, beads, pottery shards and 3 stone 'dilmun weights' which turned out to be portuguese cannon balls of a much later period.Also visited the Tree of Life on several occasions. The freedom to roam and pick up whatever you found in those days are long gone and the fort itself is unrecognisable now but my facination with the country remains. During my first visit in Bahrain (I am from Spain) my husband, Bahraini, brought me here. He told me about its history-I had no idea that the Portuguese had been in Bahrain. I found it amazing. There were many tourists, both foreigners and locals, so I imagine is quite an important spot in the region. What amazed me the most whas the fact that there is no entrance fee and that it was very clean and well preserved. It is a must-see in Bahrain. The views from the fort are awesome! Thank you Abbas for such a wonderful day! When we were visiting Bahrain in early 2005 the fort was undergoing the final touches to a refurbishment so it was not totally surprising to see it receiving inscription in that July as Bahrain’s first WHS. In the (very fine and “not to be missed”!!) Bahrain National Museum we saw earlier photos of the fort and “reconstruction” might be a better word to describe the activity. Large car parks, “interpretive signs” and pathways designed for disabled access show that the government intends this to be a significant “visitor attraction”. We preferred the unbelievable 40000+ mounds at the A’Ali burial field and the Saar “Heritage Park” (both are on Bahrain’s Tentative List). From its name this latter may have “better” things planned for it but at the moment is a wonderfully unadvertised and unspoilt excavation of a Dilmun town (it wasn’t even mentioned in my Lonely Planet and we only found it because it was on the WHS Tentative list). It is staffed by a single bored policeman who seemed very pleased to see anybody! All of these sites could be seen in one day together with the oilfields and the somewhat disappointing “Tree of Life” which is having its life snuffed out of it by locals swinging on its branches. Give the museum a full half day and then take in the old Arab houses on Muharraq. From "Qal'at al-Bahrain Archaeological Site" to "Qal'at al-Bahrain - Ancient Harbour and Capital of Dilmun"